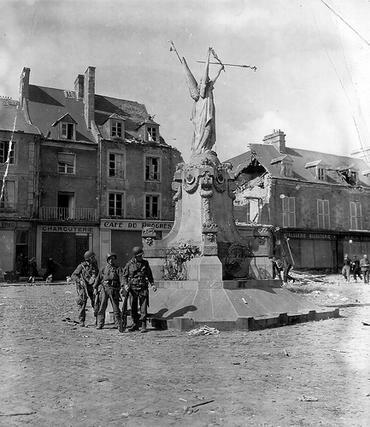 Photo # 1. shows three US infantry soldiers taking the time to pose beside the monument in Carentan's main town square, French civilians can be seen to the left and right of the photograph. A bomb damaged building can be seen over behind the monument. Photo # 2. comparison shot taken Christmas 2011, the square has now become a public car park, and Christmas decorations stand around the monument.